Years ago I remember wishing I could experience a bit of what immigrants experience, or that some could communicate their experiences in ways I could understand. They’d started out somewhere I’d never been, and they’d arrived somewhere they’d never imagined. Like Finland. Cold, white, communal, with few racial or religious tensions. I was eager to hear it all, but such stories, if they existed, were rarely published in the U.S. All that has changed now and I couldn't be happier. 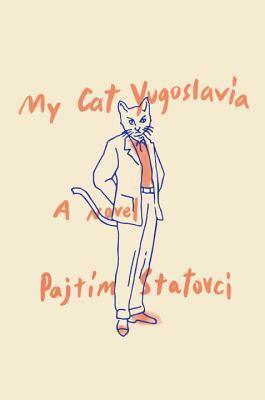 This remarkable debut by the 27-year-old Statovci gives us that strangeness, familiarity, differentness, and similarity in a wild ride from Kosovo to Finland, from traditional society to an open society, from cultural acceptance to social ostracism. See how the arrows in that sentence seem to point in opposite directions? Therein lies the tension. Two seemingly unrelated stories, one featuring a talking cat, twine and twist through the first part of the novel, both stories engrossing: a woman describes the lead-up to her traditional marriage…the clothes, the gold, the mother-to-daughter secrets, the preparations. The other thread features the cat and a snake, neither of which we want to take out eyes off for very long. They are both dangerous. As readers we don’t object to the fact of the cat, though by rights we should. He is thoroughly obnoxious, insulting his host and then being falsely obsequious. He comes for a tryst and stays for meal, which he then refuses on the grounds such food would never cross his lips. He insists on eating meat in a vegetarian’s house, and he takes long, splashy showers…he is your worst nightmare, the height of self-regard. The snake—I’d like to hear your take on the snake. A boa constrictor. He’s a wily one, seems to have formed a kind of attachment to his owner, in that he doesn’t threaten him, but he does threaten a guest…Throw a dangerous animal into a story and see if your attention flags. It’s a old trick that works every time. We don’t take our eyes from him whenever he appears from behind the couch. But it is the story of the wedding that grabs us by the balls, as the expression goes. We are shocked, distressed, angry. We try to imagine how we would handle what comes up, both as a young person, and as an adult. We think over decisions we make so quickly, painlessly in adulthood that are so tortuous and fraught in youth. All this is overlaid with the portrait of a family of seven living in one room provided by the Finnish government to refugees. The bunk-beds squeak so cannot be used. Mattresses cover the floor. Four or more families share a kitchen, a bathroom. It is nearly intolerable until they remember what they left, native Albanians in a Kosovo run amok. The Bosnian War was brutal beyond all imagining. There is that. The stories twist and twine through one another like the loops of a snake, another of which, a poisonous viper, makes an appearance later in the book. The viper is only a meter long, and is captured in a plastic bag. It doesn’t provoke as much anxiety as it should. When a plastic bag reappears later in the story, holding not a snake but a book, The White King by György Dragomán, we wonder…can the snake represent his father, the bully whose influence stays around, silently inhabiting the places we live? Deadly, but sometimes ineffective, who might be deflected or exorcised with understanding and effort. And the cat? There is more than one cat. The first cat talks. The second cat was abandoned, uncared for, unloved in the native country until rescued and restored to health. And finally, there is the black cat in a litter, “just normal, mongrel kittens,” in the author’s words, to distinguish them from the black and white cat who speaks, and the orange cat who doesn’t. The talking cat so full of himself could be the author himself, and the follow-on cats could be those who’d suffered during the war, coming finally to the children, those ‘normal’ integrated ‘mongrels’ who’d adjusted to their new environment in their adopted country and married with locals. The disturbing shifting sexuality throughout this novel, in a person from a traditional culture with unresolved parent issues, has a touch of intimidation and coercion about it, in the beginning at least. By the end I am much more comfortable that our narrator’s sexual choices are healthy ones, and begin to wonder…is this one of the things that caused the rift between his father and himself? Statovci succeeds in capturing our attention with this debut, recounting an agonizing childhood and an adulthood filled with sudden emotional traps. His use of a female point of view is extraordinarily effective in making us inhabit her choices. He shows us the distance an émigré may feel from his host country, no matter how conflicted these feelings are with gratefulness and surprise and ordinary, daily joy at being alive. He shows us the pointed, hateful bullying in town—a step up from ordinary schoolyard bullying—that may provoke withdrawal rather than a healthy resistance and reliance on home-grown values. This is a thrilling debut. Bravo!